This is in response to Dr Brett's excellent series of posts for developing traders. In my opinion this is holy grail information. The old adage is to buy low sell high. That sounds easy but so many seem to always buy the high only to have the rug get pulled out from under them, or sell the low only to to have the offers lifted. People see declining prices and assume weakness and rising prices as strength. However it doesn't work this way. Markets move based on what is called "paper", ie institutional buyers and sellers. Dr. Brett just talked about this here. In FX its primarily central banks and institutional paper. These market participants make profits from price appreciation. The only way to do this is to buy at a discount and sell at a premium. Or, if short, sell at a premium and cover at a discount. Therefore they HAVE to buy when the market "looks" weak (trending down) and sell when it "looks" strong (trending up). How do you know when institutions are in buying or selling so as to get on the "right" side of the price action? You have to look at Volume. Volume is extremely important because he who controls the supply also control the demand. Institutions have more money than you do and will inherently control the demand (or lack there of) as a result. Specifically you are looking for abnormal increases in volume. I plot bollinger bands on top of my volume to clearly identity these nth standard deviation events. You then have to look at the reaction of price to volume. Is it still trending in the original direction, has the trend slowed, has it reversed? Trends can only continue if there is enough volume to allow the imbalance of supply and demand to continue. If there isn't, there trend will reverse until price it met with volume once again to continue or reverse price. You HAVE to look at larger time frames to find the bias of paper. They do not care (nor can they) about smaller time frames that smaller traders use. 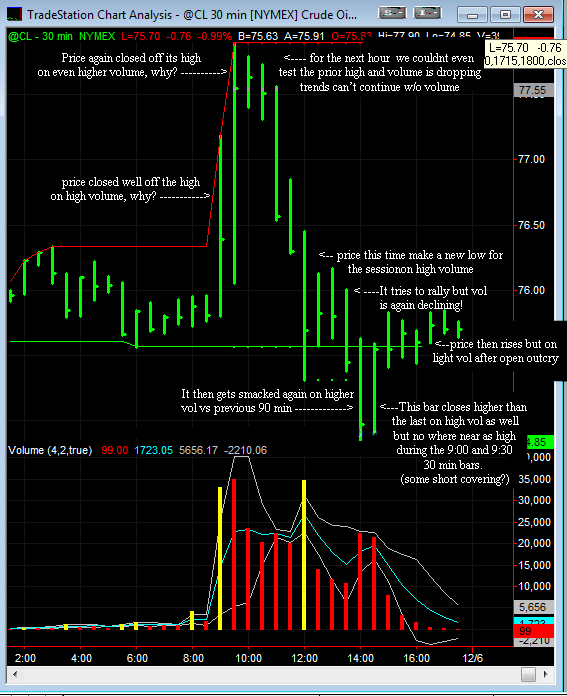 From there you can then time your entry and exit using the exact same methods of price and volume to enter and exit you trade. Why does this work on larger and smaller time frames? Price movement is a function of supply and demand which manifests itself on every time frame. The reason you need to look at larger time frames to get a bias is because if you don't, you will get whacked when a trader from a lager time frame (paper) comes in to make a trade. You are then at the mercy of whatever they are doing. He who controls the supply also controls the demand. Why did price move higher to begin with? Because of an influx of demand hit the market causing a breakout. Momentum traders, HFT then added to demand to increase prices. Why did it fail so bad after making new highs? Because institutional paper "absorbed" all of the demand from the move up (price never closed at the high of the bar). This is why volume dropped shortly after which led to prices NOT continuing higher (demand dried up). This resulted in an imbalance of supply vs demand which caused prices to fall. Supply was then added to the market to create our first session low and then the second. Why did price then bounce? That supply was then "absorbed" by demand which resulted in an imbalance of demand which increased prices. If trends cannot continue without without volume, how can we have rising prices on abnormally low volume? You must be referring to these type of situations that everyone seems to hate. The reason is simple, on the prior instance of selling on high volume, that supply was absorbed by paper (otherwise there wouldn't have been high volume). This REMOVES supply from the market allowing for demand (no matter how weak) to lift prices. We know this happened because prices then began to rise! What about if I'm really bearish on the economy and the market? Paper doesn't care what you think, they will buy and sell without consideration to your viewpoint. As a trader your job is to make money, you do this buy identifying the same supply and demand imbalances that institutions are identifying. You will lose 100% of the time trading against paper. He who controls the supply also controls the demand. Strength on down bars and weakness on up bars is intuitively backwards. Yes. This is why 90% of traders lose money since they do not know how the market (any market) actually works or do not have the discipline to hold themselves accountable to playing by the rules. Carry this further, 10% of the population is "wealthy". How? they had to do something completely different that the majority of the population in order to have above average compensation. They had to go against the majority of what they saw others doing. In essence, when the trend "looked" bad, the went long. When the trend "looked" good they went short. Excellent and insightful post. I could not agree more. Really good stuff...Thanks for posting that. Awesome stuff man I agree!